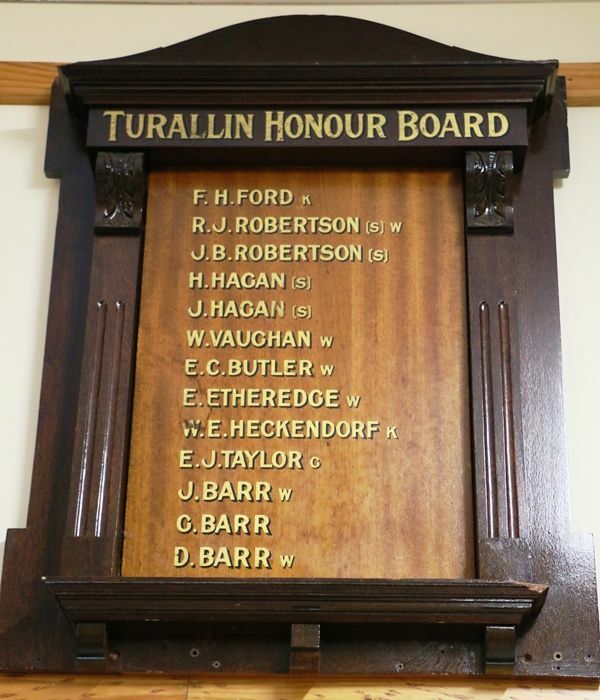 The wooden honour roll commemorates those from Turallin and district who served in World War One. The public of Turallin, Western Creek, and surrounding district assembled in large numbers at the Turallin State School on Wednesday night, 12th inst., for the dual purpose of unveiling the Honour Board to district soldiers and to welcome home Corporal Jack Barr and Gunner George Barr on their return from the battle fields of France. Councillor W. H. Etheredge, of Western Creek, when unveiling the board on which is recorded the names of those brave boys who had gone forth to their duty, paid a just tribute to their patriotism and sacrifice, and expressed pleasure that such a record was to exist to commemorate their loyalty. Mr J. R. Bacon, on be half of those present, extended a hearty welcome to Corporal and Gunner Barr wishing them good health and future happiness. The lads, who looked remarkably well, were heartily cheered. A dance followed, the evening passing most pleasantly. Pittsworth Sentinel (Qld. ), 23 August 1919.